Home » Rain • Scarification » Can I scarify a lawn when it is wet? A common question during the scarification seasons is a simple one. Can I scarify a lawn when it is wet? As with many issues with lawn care the answer is not just yes or no. We are dealing with the natural world and the simple description “wet” can cover a huge range of different lawn conditions. From slightly damp leaves to waterlogged. I will try to explain the basic conditions and what to do if you want to scarify a lawn when it is wet. Is it actually raining? It is unpleasant scarifying in the rain. Your machine and tools will get filthy, and you probably won’t do the lawn any good at all. I would postpone your scarifying until it stops raining at least. Has it just stopped raining? Ask yourself how much has it been raining recently? Heavy rain for many days will have saturated the soil. However, a light shower will have just dampened the grass. Step out onto your lawn and look down at your feet. If the soil is at all “squelchy” or you see puddles and bubbles under you feet, absolutely do not scarify. Even stepping on the lawn will be damaging the structure of the soil and compacting it. Stay off the lawn and wait at least a few days. Has it rained recently? If you have had a short dry period the ability to safely scarify will be down to the makeup of the soil. If your soil is quite heavy, clay based and takes a long time to drain, I would not scarify until you have a prolonged period of dry weather. You really do not want to churn up waterlogged soil as this will harm the lawn. Lawns on clay soils usually do not create a lot of thatch, so consider if you need to scarify at all. If your lawn is on a loam or sandy soil then if will most likely be ideal scarifying conditions. 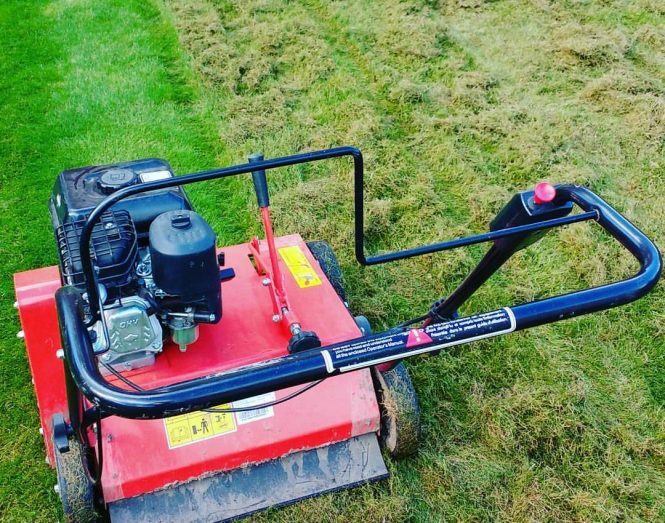 A moist soil and dry grass leaves will achieve an excellent scarification result and the grass will recover quickly due to the availability of moisture. Firm soil, but wet grass leaves? I would not worry about scarifying wet grass leaves. The machine will still remove moss and thatch effectively. The only concern in this scenario is that the scarifying waste does become a lot heavier when it is wet. In this case, if you are able to leave it to dry, or even scarify and then leave the thatch on the lawn to dry, then it will be a lot easier for you to remove. So there you go, the different scenarios which I can think of regarding if you can scarify a lawn when it is wet. If you are in doubt, it is generally better to wait until conditions improve. Sometimes this maybe a while, but in the UK there is usually a dry spell not too far away. If you have a question about your lawn, please don’t hesitate to get in touch. When is the best time to scarify your lawn?